Aqua Science takes great precautions to ensure that your items arrive in the best condition possible. If you ever receive a package or item not in satisfactory condition, please contact us as soon as possible at info@aquascience.net or by calling us at 1-800-767-8731. Most of the packages will be shipped the same business day or the next business day. 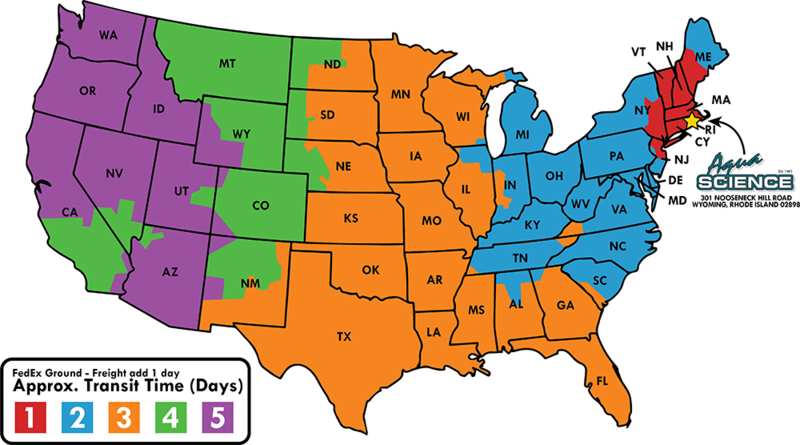 All Shipping prices on http://www.aquascience.net/ are for FedEx Ground Home shipping within the contiguous USA. Please contact us for all international shipping quotes at info@aquascience.net. Special order items might take up to two weeks to ship. In such cases, we will contact you and inform you of the estimated date of shipment. All parcel packages will be shipped via FEDEX (primarily) or USPS. Larger pressure tanks and large systems that require a pallet will be shipped via a freight company. All shipped products are protected by shipping insurance. All products shipped from Aqua Science Inc. are received by the carrier complete and in good condition. Title of the merchandise is passed to the carrier at the time of pick-up and passed to you the customer upon delivery. Therefore, when receiving merchandise from a freight carrier, you must make a complete visual inspection before signing the delivery receipt. Upon completing your visual inspection, please refer to our return policy if the inspection reveals a problem. For international shipments, the customer is responsible for any additional Brokerage Fees, Taxes, and Duties that may be applied by the carrier. Due to shipper restrictions, we are not able to send pressure tanks to Alaska or Hawaii. You must contact us within 3 days of receiving the shipment to receive our authorization before returning any product. Please call at 1-800-767-8731 or email us at claims@aquascience.net. This policy applies to all customers and is accepted when the purchase is made. Items must be in the same condition they were shipped in. There will be no returns on special order items. A minimum restocking fee of $24.95 or 10% of the original cost of the item, whichever is greater, will be charged to the account. All items to be returned must be in new and re-saleable condition, and must be in the original packaging and contain all related packing, accessories, guarantees, and instruction manuals. Used equipment will not be accepted for return. There will be no returns on international shipments. There will be no returns on used filter cartridges. There will be no returns on New or Used Electrical Components, Ultraviolet Sterilizers, UV Lamps and Quartz Sleeves. Return shipping charges will be the responsibility of the purchaser. If an order is canceled by the customer after an item has shipped, the customer is responsible for all shipping costs. We strongly advise the purchaser to insure the returned item as we will not be held responsible for damaged or lost merchandise. Warranty returns are subject to the manufacturers’ approval. Shipping charges for both the new and the return item is the customers responsibility. Products should be installed by a well water and filtration professional. All clearance (including scratch and dent) products ship with the original manufacturers warranty. While we will warranty defective products, there are no returns on clearance products. All sales are final. Aqua Science ships the majority of our items directly from our warehouse. 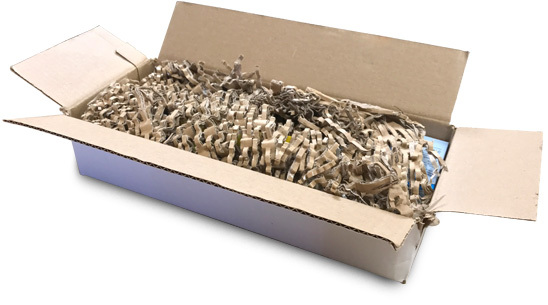 Packages are reinforced with corners, extra boxes or packing material as necessary to provide the best chance of minimizing damage that may occur once the package leaves our facility. Packages are securly closed with reinenforced kraft tape with our logo. We primarily us FedEx Ground for shipping and can get packages to most of the United States within 5 business days depending on your location. Many of our items ship for free but if you are in need of your items faster, we can make arrangements to get them to you at an additional cost. Call us at 1-800-767-8731 for fast shipping options. Our freight items always leave our warehouse securely strapped to wooden pallets. It should arrive to you in the same way that it has left our hands. 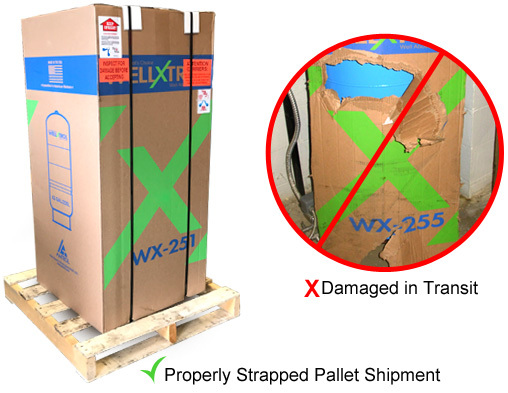 If a freight shipment arrives unstrapped from the pallet or out of the original box it should be inspected closley for any damage from shipping. You should always fully inspect the item when it arrives and be sure it is free of any shipping defects. If there is noticeable damage to the box or to items in the box, please make sure they are noted by the shipping company on the paperwork. If the package is severely damaged, you do have the right to refuse the shipment. If any issues occur, it’s best to get as many detailed photos as possible and contact Aqua Science as soon as possible. 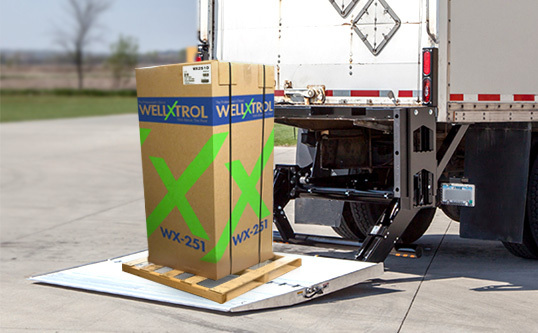 Oversized packages and heavy items may require a Lift Gate to be delivered safely. See the “What is a Lift Gate” section for more information. A Lift Gate is the back portion of a delivery truck that helps lower large loads, packages and pallets to the ground. Not all delivery trucks are equipped with this feature. Liftgate delivery is not included in our free shipment service. This is an option that needs to be determined in advance of delivery and paid for at time of checkout. Please Note: If you don’t need a lift gate delivery, you will be required to get the package from the back of the truck to the ground on your own. You may need additional help in receiving your delivery. Transit times shown are for FedEx Ground service, and while fairly accurate, are approximate. For transit time and shipping cost to Alaska, Hawaii, Puerto Rico, or Canada, please call 800-767-8731.